The Xootr carry strap allows you to easily carry your scooter when folded. 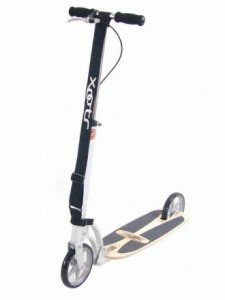 Once you reach your destination, just lower the handlebar and sling the scooter over your shoulder. 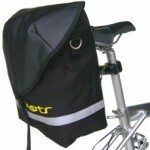 Once the strap is installed, raise the handlebar to the height you normally like and pull the strap tight. This allows you to easily extend the handlebar to a preset height. The strap fits flat against the front tube and handlebar when riding your scooter.